At 1:36 p.m. last Friday, a board member of the Corona American Little League texted me. He was planning festivities for the league’s Opening Ceremonies, to be held the next morning. “Would you do us all the honor and perform a ‘first pitch’ in memory of Jax?” he asked. 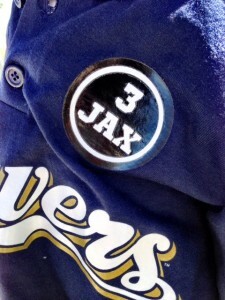 He went on to write that our Rookie (t-ball) Brewers were being highlighted, and they’d also release 12 white balloons in Jax’s honor. How do you say no to that? 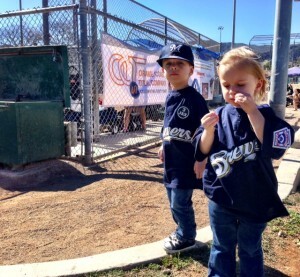 If you don’t recall, prior to the 2014 season, we approached the league about permanently sponsoring the Brewers t-ball team. It was a way for us to give back and honor our boy. But the league did much more than that. This year, I was managing the Brewers team. The next day we were throwing a fifth birthday party for Gray and Ellie, so my wife was going to skip Opening Ceremonies. Instead, she decided to come, along with her mom who was out helping with the party. My mom and dad and sister and her two kids joined as well. 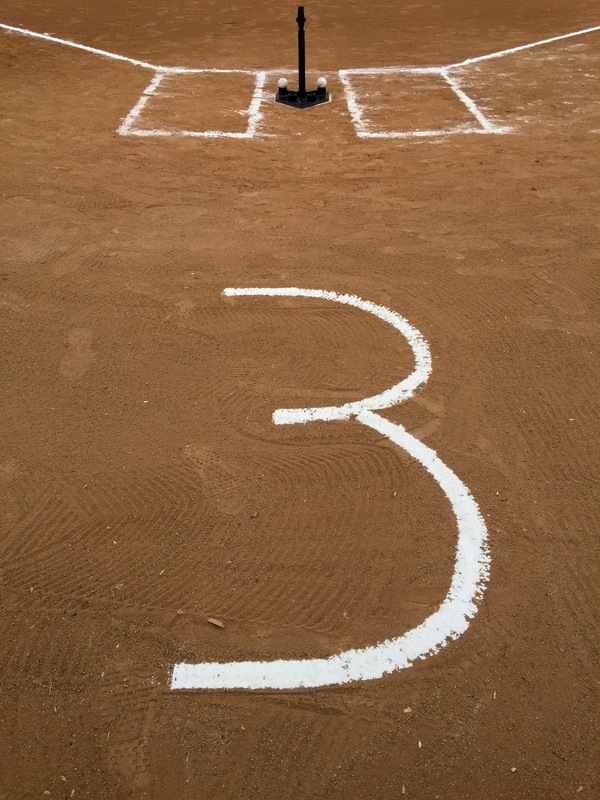 As all of the teams gathered in the outfield before the ceremony, a mom of the youngest player on my team pointed out that they wrote a big number three in white chalk behind home plate, Jax’s jersey number. From afar, I could see three pearly white baseballs resting on a folding table covered in a royal blue table cloth. As we gathered to lead the parade of teams on to the field, my family got in to place overlooking the field to grab some photos and video. 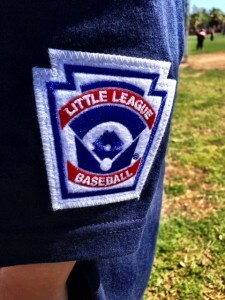 I zoned out for about 10 minutes as the other teams were introduced and joined us at the lip of the outfield grass. I chatted with our team mom and coaches and tried to keep our players seated; anything distract myself from the emotions of the day. After some words from one of the league’s board members, he introduced me. I walked, head down, towards the table with the balls. I grabbed one of those beauties, and kept flipping it in my hands while the board member spoke about Jax, our relationship with the t-ball Brewers and commitment to sponsor the team. I just wanted to get it done with. I couldn’t look at the crowd – it felt too overwhelming. I felt the eyes on me, and it made my skin crawl. I kept waiting for the board member to give the okay to toss that clutched pearl. I was in gray shorts, a black tee shirt and beat up, gnarly Converse. 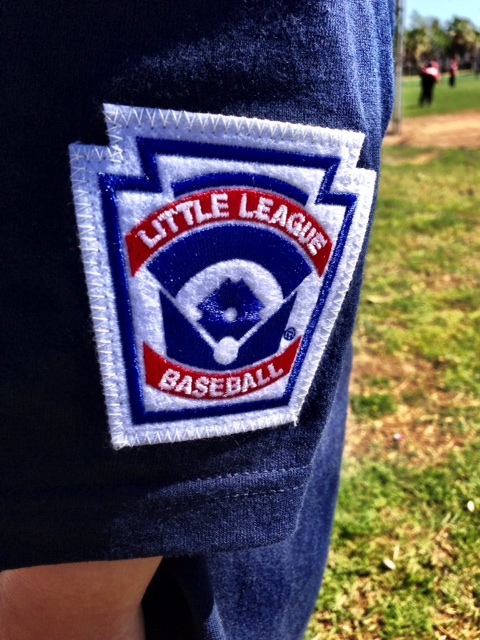 Just what you think a little league coach should look like, right? The board member finally gave the cue. I stood a couple of feet in front of the rubber on the pitcher’s mound, raised my front arm to start a quick side-step motion and painted the black on the outside corner. 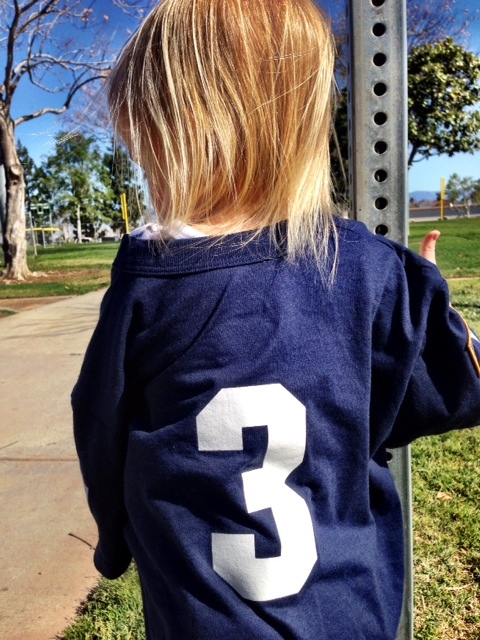 “Strike,” the board’s president said to me as I walked back to my team on the outfield grass. I pumped my fist as if to say “damn right.” My players released the 12 white balloons in to the sky. By the time I reached them on the grass, they were still watching them escape in to the heavens. I saw my wife along the other side of the fence down the left field line. As I got closer to her, I noticed her eyes red and swollen with tears. I told her I had to walk away so I didn’t lose it. I felt it coming, the emotions I’d tried to bury all morning. When I got back to my players, our team mom was fixing Ellie’s pony tail. The mom told me Ellie had started crying. I asked why, and she said she was sad. I asked Ellie what was going on, and she told me she just missed Jax. This, from the girl that never shows emotions or wants to talk about her feelings when it comes to Jax. I just always figured she had ice in her veins. 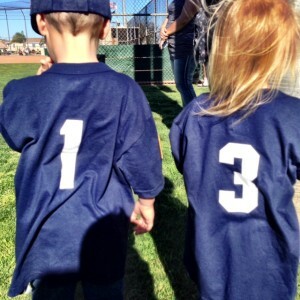 Gray talks and shares and asks questions constantly about his big brother. Ellie usually sits in silence, asking my wife or I if we’re going to cry. She just doesn’t want us to cry. So to hear that she cried, and was moved by the day to lead to some sort of feeling, was special to me. An active military servicemen and a player in the league battling an illness (this is all I can give you, as I could barely hear because all of the speakers faced the crowd, away from us) threw out the other two first pitches. And with that, opening ceremonies ended. The league scheduled us to play immediately following the ceremonies, as they continued to highlight our Brewers team. The hope was to get a lingering crowd to stick around and watch us play the Giants. It worked. It was a relief to finally get to the game. We were the home team, so we were in the field to start. Ellie fielded all four balls they hit in the first inning. She was a vacuum. About an hour later our game ended. The team played really well and I couldn’t have been more proud. Our shortstop made a sweet forehand play up the middle, tagged second base and threw to first. It’s as close to a double play as you can get in t-ball. Gray, inspired by pretending to be a Jedi with a light saber striking down a Sith lord, ripped line drives in all three of his at-bats. It was the hardest I’ve ever seen him hit balls. None of our players ran to third base after hitting from the tee, and while I may be biased, our team played considerably better than the Giants. BUT I MAY BE BIASED. It was the kind of start to a day that Ice Cube would’ve rapped about (except I didn’t get a triple double, despite messing around). Our family is touched by the league’s willingness to continue to honor our special boy. To help us share his memory to those that knew him and perhaps played with him four years ago, and many that didn’t know of Jax or our story. Damn right it was a good day.